Movie Review: «Hansel and Gretel Witch Hunters». English Title: Hansel and Gretel Witch Hunters. Release Date: 24.01.2013 (Argentina), 25.01.2013 (USA). Russian Distributor: Central Partnership (17.01.2013). Genres: 3D / IMAX / Action / Comedy / Fantasy / Horror. Starring: Jeremy Renner, Gemma Arterton, Famke Janssen. Cinematography done by Michael Bonvillain, who shot Cloverfield (2008) and also Zombieland (2009) is really professional here. The estimated budget hasn’t exceeded 60 mln. USD. However, all the few locations are carefully detailed, and even the Gingerbread House looks tasty like being made of all kinds of sweets. The crew of the Hansel and Gretel Witch Hunters film even dared to include flight scenes using broomsticks, since not a single witch can live without one, and the usual «Green» screen helped to make it possible. The fantasy action movie was filmed in 3D, though if you plan to see it, better do it in an IMAX 3D theatre, where you’ll uncover more visual effects than post-conversion to 3D provides for some other titles, which prefer to add 3D during Post-production. All the debris and particles are moving out to haunt the audience, and remember this, when choosing the first sitting rows, ensuring the maximum dive for these. The film had a gunsmith, who developed a variety of weapon models based on medieval classics, but greatly improved with burst-fire and gunpowder ammunition. Lovely music for the story of Hansel and Gretel Witch Hunters was composed by one Icelandic maestro - Atli Örvarsson, author of the soundtrack to the Vantage Point (2008) thriller, where we liked it too. Executive music producer’s name serving here is Hans Zimmer, and it should ring a bell, since most recently he scored expensive projects such as Sherlock Holmes: A Game of Shadows (2011), Madagascar 3: Europe’s Most Wanted (2012) and The Dark Knight Rises (2012). 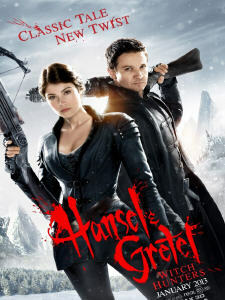 The film Hansel and Gretel Witch Hunters looks good as a cheerful slasher for the adult audience. Built in a Fantasy world it features suitable actors and vivid special effects just to enjoy how both Jeremy Renner and Gemma Arterton kick some witches in fierce battles. Yet, the dialogues are rather primitive here, what does spoil some imporession, so we would advise the writers next time to visit Quentin Tarantino’s master class, who is brilliant in making proper remarkable lines even for Action titles.